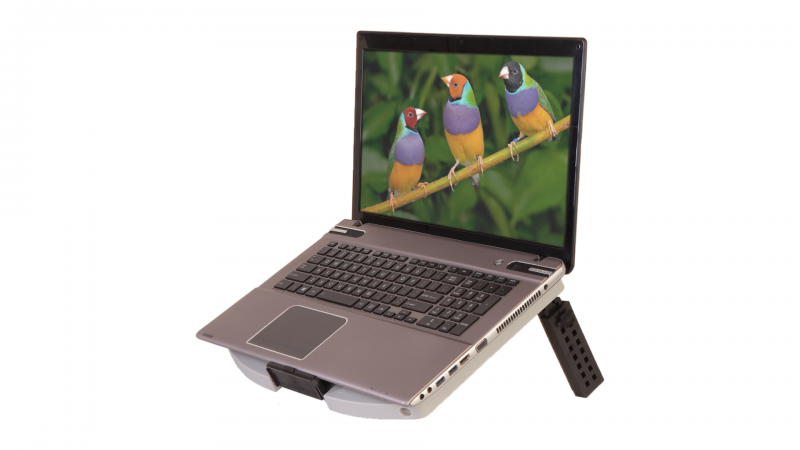 The LTS-100 Portable Stand is a perfect ergonomic accessory to any laptop/notebook computer up to 18 inches screen size. It can withstand up to 20 lbs. weight. The platform is height adjustable from 6 to 9-1/2 inches in 1/2 inch steps. Provides combinations of multiple viewing angles and heights to suit the individual user's needs. Reduces strain in the back and neck of the user by providing a comfortable and ergonomically proper posture. Light weight (2.3 lbs.) and can be carried along with the laptop computer. Robust design, strong and durable construction made with engineering plastics. Vented base prevents heat build-up. Fordable ledge in the front prevents laptop from sliding off. Comes fully assembled and ready to be used. Folds flat quickly to 1.2 inch thickness and becomes portable to be carried in a laptop bag. Adjustable to get Multiple Heights and Angles. Folds Flat and Fits in a Laptop Carry Bag. Dimensions: 14.5 x 11.3 x 1.2 inches. Part# LTS-100 By Creative Products, Inc.